The selected works of art from the Petrucci Family Foundation Collection examine African and African-American cultures and identities through varied representations of the human figure. 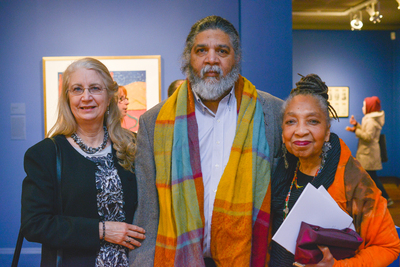 The exhibition consists of prints, paintings, drawings and sculpture from prominent contemporary artists including Faith Ringgold, Kara Walker, Jacob Lawrence and Alison Saar as well as significant artists from the 1930s, 1940s and through the Civil Rights Era, such as Hughie Lee-Smith, John Biggers and Hale Woodruff. While many of the works are extraordinarily personal, expressive portraits, other subjects address issues of labor and leisure, religion and spirituality, the civil rights struggle and the African Diaspora. The artists in this exhibition reflect diverse stylistic influences and re-appropriate visual motifs not only to denounce centuries of oppression and confront the legacy of slavery, but also to celebrate multifaceted cultures and their own diverse identities. Additionally, they use the figure and unique faces to explore beauty, humanity, compassion and strength within a fraught, but resonant past. See the exhibit poster here.